I can't believe it's December and the start of my baking season at least. I don't bake a great deal during December, since there's only two of us to eat it all. And we really don't need the calories, but there are a few things I do make. 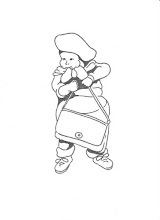 One of which is by request, Fransk Vafler or French Waffles in English. 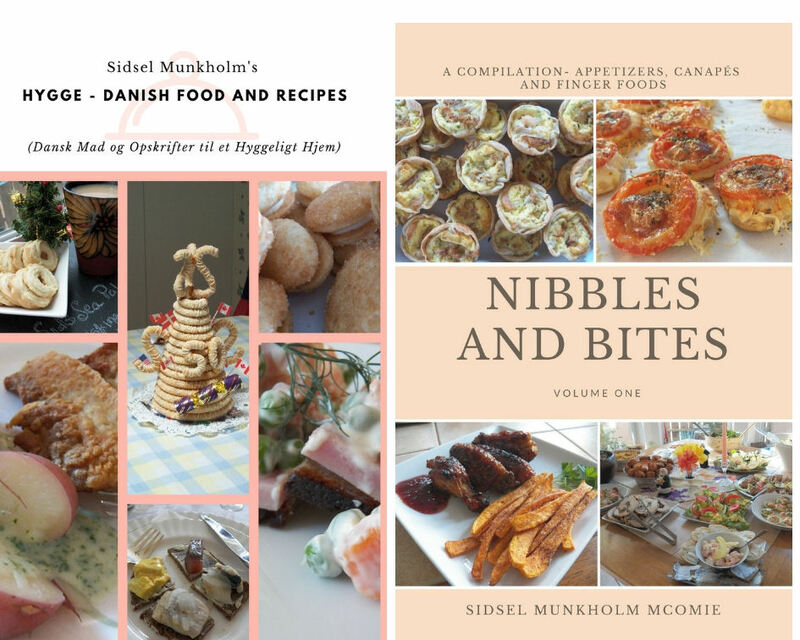 This year I'm also going to make some Vanille Kranser, some Jødekager, Klejner and also Brunkager. Don't worry, I'll translate them later. These were all cookies we made when I was a kid. Those weren't all we made, but I'm not that fond of Pebernødder so I won't make them. I've never made a Sugar Cookie in my life, and don't really plan on learning how, well, not at the moment at any rate. A former neighbor and friend (not former friend, still friend), used to make some really great Sour Cream Sugar Cookies every year, and she spoiled me for every other sugar cookie. Just to wet your appetite here's a picture of some of the French Waffles I made last year. 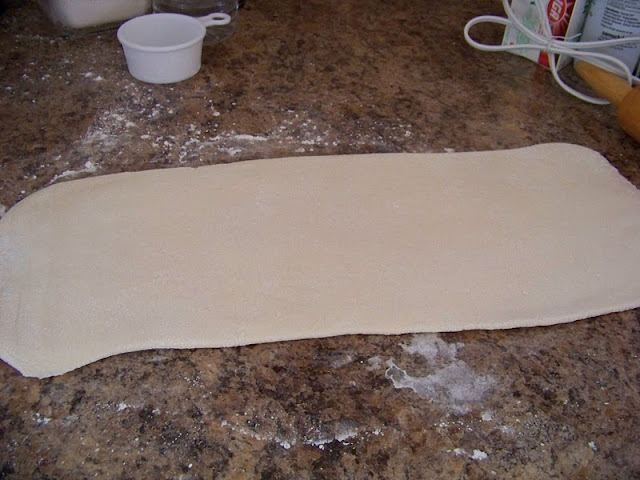 But this post isn't about cookies alone, this is about my attempt at making my own Puff Pastry. And I want to stress, attempt. My first batch looked great, tasted wonderful, but the butter got too warm and melted all off into the bottom of my formerly clean oven. Did you know butter can run out of stuff and make a lovely little puddle in the bottom of the oven? Which in turn created a lovely smoke haze in the kitchen. Was not a great idea to start this when I knew I had company coming, but hey, I'm sometimes a fearless cook in the kitchen and I can screw up big time. Let me tell you, it was not pretty. And the reason I attempted to make my own Puff Pastry, well, that sticker shock in the grocery store, not a pretty picture, not at all. I'm standing there holding my favorite brand of Puff Pastry in my hand and looking at the price and I think I screeched "YOU WANT HOW MUCH!!!! " And since the store kept putting my favorite brand of butter on sale the past couple of weeks, I finally figured it out, and decided to try my hand at making Puff Pastry. Here's the how-to's and some pictures. I did make a second batch of pastry and froze it. I'll take it out and play with it this weekend, and let you know how that batch turns out. 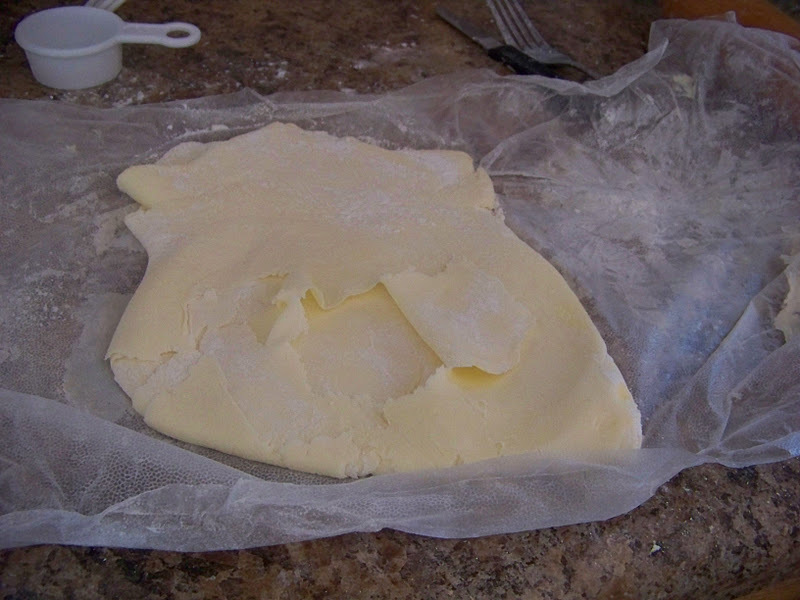 Start by mixing the 14 tablespoons of butter with 1/4 cup of flour. I sprinkled the flour onto a sheet of plastic wrap, then cut the butter into chunks and sprinkled them over the flour. Then I folded the wrap over top of the butter and flour and proceeded to use my rolling pin to press the butter and flour into each other using a rolling motion. (it did save a lot on cleanup). 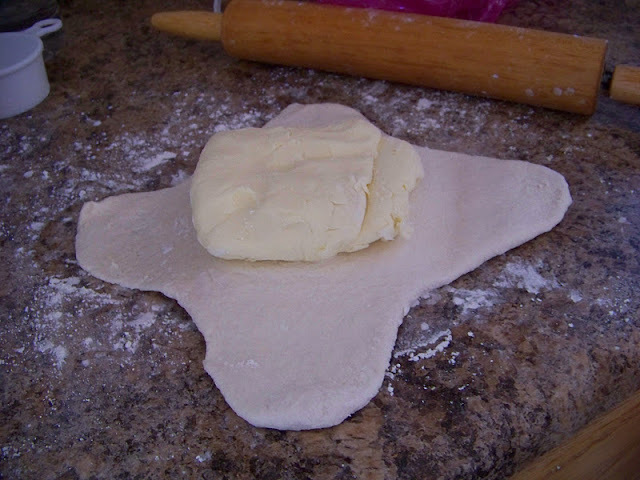 I would press the butter/flour mixture together with the rolling pin until it resembled a flaky mess. Every so often I would gather it together into a ball, then re-wrap the ball and use the rolling pin to press it together again. (Umm, next time, I'm just going to stick it into the mixing bowl of my Kitchen aid and let it do the mixing for me.) I wanted to do it this way the first time because that's what my cookbook said to do. Form into a flattened disk about 4 inches by 4 inches. Wrap and set aside. Now for the rest. Mix the remaining 1 1/4 cup flour with the two tablespoons of butter and the vinegar, then drizzle in the water as you're mixing it together until it forms a ball. You may not need all the water. Work this dough ball until it's nice and shiny. This is called the détrempe. (just thought I'd throw in the correct term for this so you'll think I know what I'm talking about). Roll or pat out into a rough square about 6 inches by 6 inches. Place your butter disk on this and mark where it's at by lightly scoring the dough. Remove the butter and place aside for a minute. 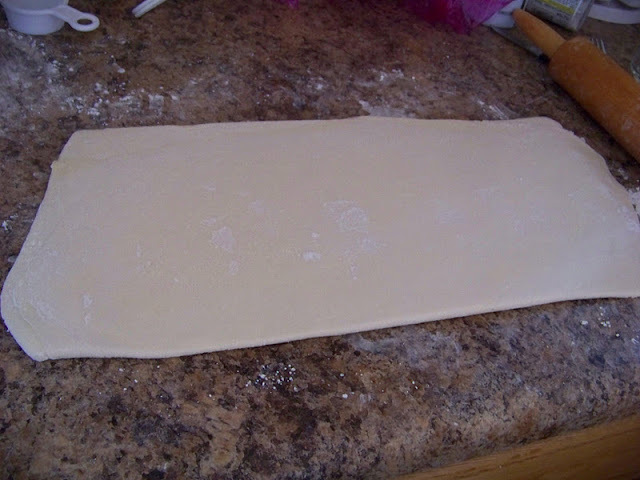 You then proceed to use the rolling pin and roll out the side to make 'wings'. Take the wings and wrap them over the butter disk. Pressing together lightly. See how cool is that? Now for the fun part. Using your rolling pin you need to roll this out into a rectangle, approximately 12 inches by 6. And roll it out again. Turning it a 1/4 turn each time. 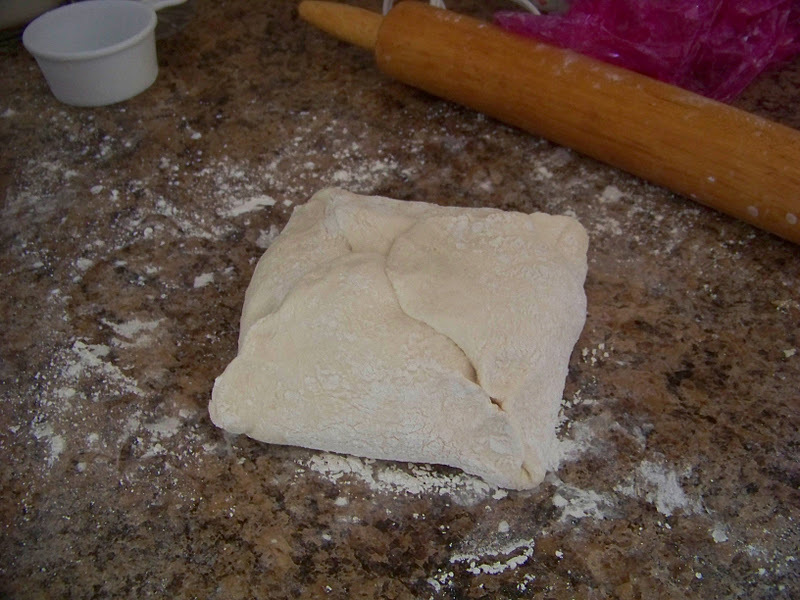 Repeat two more times, wrapping the dough and letting it rest in the fridge for about a half hour each time. You do want to keep the dough as cool as possible. (I know whereof I speak on this one, sigh). And... if you're like me and lose track of the times you've rolled it out, well there's an easy fix for that. Just press your finger into the dough, make an indent, one time for the first time you roll it, then make two indents for the second time, and three indents for the third time. 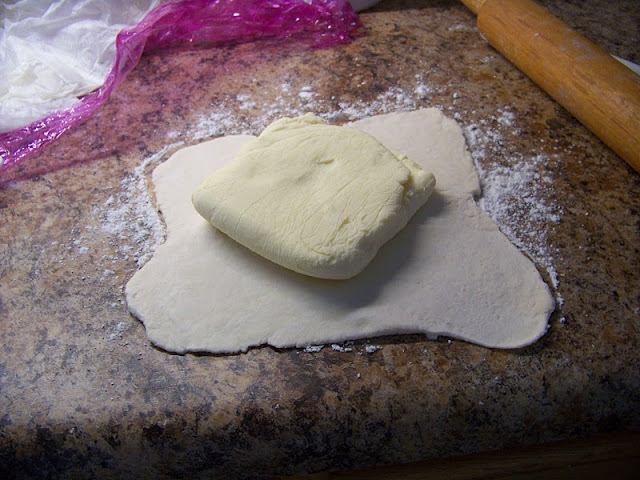 Each time you roll and fold the dough, you are creating more layers, and I know there is a mathematical formula on this, but I couldn't tell you what it is. I just know lots of layers are a good thing. And butter is never bad. When you've let the dough rest the final time, take it out of the fridge and roll it out one more time. 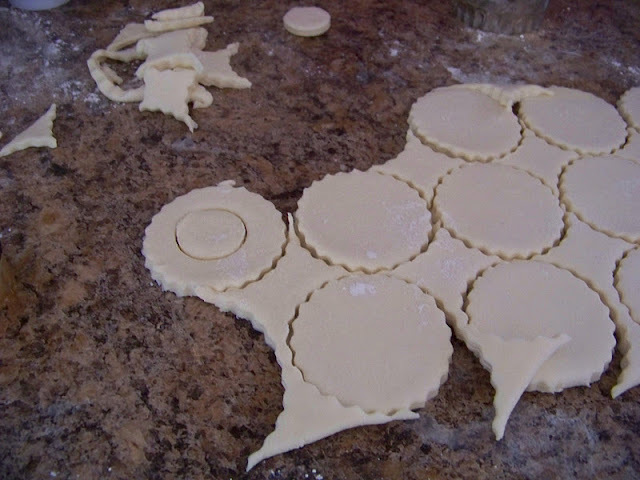 Then use a cookie cutter, or sharp knife and cut it into whatever shapes you like. 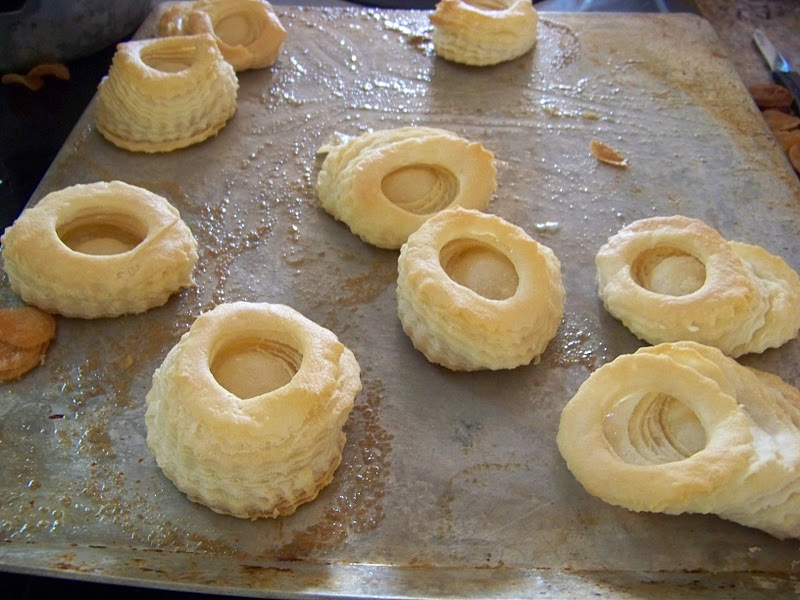 I wanted to try making some Vol au Vent shells so I used my fancy cutter and cut out the shapes for that. I cut the base out, then on half of them, I used my teeny, little cutter and cut out the center. I placed the ring on top of the base and sealed it with a little water. And you know me, forgot to take the picture of them on the cookie sheet. grrrr At any rate, I placed the pretty little shells on the baking sheet, stuck them into a 425 deg. oven, that I'd preheated, and proceeded to bake them. I think I said at the beginning I'd let them get too warm, so the butter melted out at a terrific rate, and puddled in the bottom of my oven, creating a smoky haze in the air. When I turned on the oven light and looked, my pretty little shells had slipped drunkenly off of each other and looked a little silly. (But they did rise, so I must have done something right). I finally gave in and took the shells out and tasted them. They did taste lovely, just didn't look that great. And they should have stayed in the oven a little longer, but quite frankly the smoke was getting to me, so I pulled them out. See the melted butter all over the sheet. I still have the other block of Puff Pastry in the fridge and am going to pull it out and make something out of it for dinner in a couple of days. I'll let you know how that one turns out. 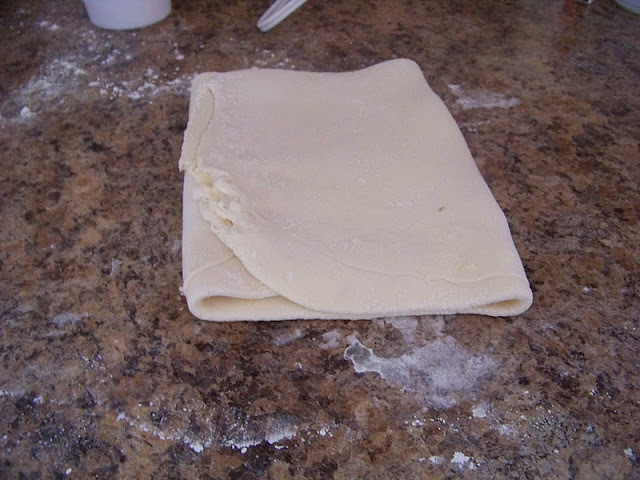 Here's a link to a great tutorial on Puff Pastry. You ARE brave! Good luck with the next batch. Thanks, I'll post about my results, good or bad when I make it. Love this project. I have been thinking about making something like this for tarteletter, mmmm. I'm going to post my continuing adventures with the remainder of the puff pastry next week. Mom used to make tarteletter and I love them, which is why I tried my hand at making the pastry.